Many people are looking forward to today’s Super Bowl Game, whether to root for one of the two teams, or with plans to watch – and rate – the commercials, or to get together with friends for food, drink, and camaraderie. For the players on the two teams, however, the Game is the culmination of years of hard work and sacrifice. Getting up early in the morning as kids (with their parents!) for workouts. College play. A statistically impossible contract getting onto a professional team. Then over this season were the workouts, watching their diet, tough games (contact sport? more like a collision sport!) to earn the chance to play literally in front of the world tomorrow night. The same goes for the thousands of men and women involved with the teams, the broadcasters, advertising agencies, and sponsoring corporations. For all of them, tomorrow night pr itogram represents the results of years of education, effort, talent, long nights, and hard effort. So what does that have to do with you? Do something hard today. Run an extra mile or do 1 more pullup, carve out an hour to play outside with your kids, spend a few minutes working on that kick that you just can’t figure out, do that one chore that you never seem to be able to get to. Make tomorrow a super day for you and take some time to be your best self. Don’t let the the two teams get the day all to themselves. Tonight, you can watch that game knowing that those players, advertisers, and half time performers aren’t the only people who worked hard and did something awesome! 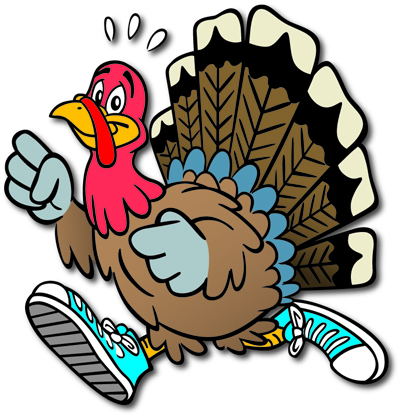 You may not know it, but Thanksgiving morning is one of the busiest days of the year for runners of all shapes, sizes, and abilities. 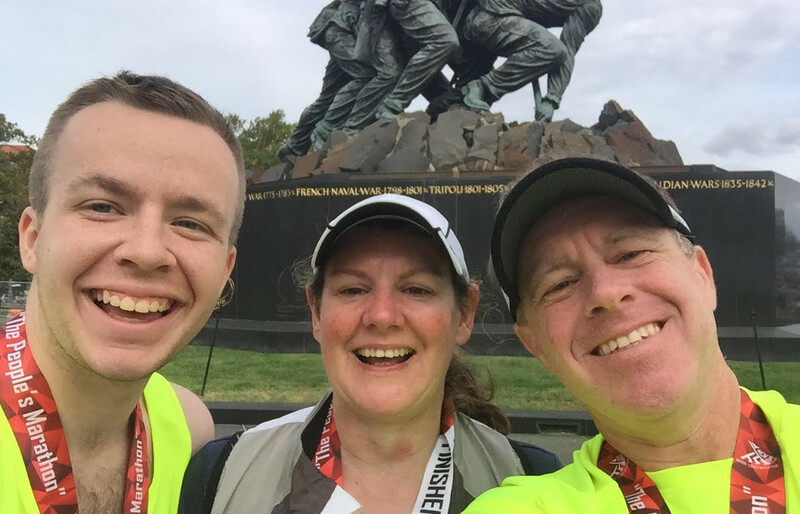 Many of us rise early to run, or walk, the first slice of pie off before we have breakfast. It is called a Turkey Trot. Most are in the 5k-10k range and are usually generously timed (you can walk the distance during the time allowed). It is a great way to get the metabolism cranked up on a day traditionally known for feasting and watching football. It is also a great way to continue being active while the dojang is closed for the extended holiday break. Let’s Paint the Dojang Pink: Be Ryong is Helping in the Fight Against Breast Cancer! October is Breast Cancer Awareness month, and in support Be Ryong will be taking up a collection to donate to the National Breast Center Foundation (NBCF), located right here in Alexandria. underprivileged and uninsured/under-insured women in the community. IMPLEMENT TECHNOLOGY to provide high quality screening and treatment services in order to detect breast cancer at earlier stages. There is a box at Master Yun’s desk where you can place your donation. Make checks out to National Breast Center Foundation, and write Be Ryong in the memo line. You can put in cash and it will be donated in the name of Be Ryong. Checks are better, though. You can also donate directly through their website listed above. NBCF is a 501c(3) organization, and donations are tax deductable. For every donation of $5 or more, you can put a message on one of the Pink Dragon Ladies that you’ll find near the collection box. You can write the name of a friend or family member who is fighting or has fought through this terrible disease. Or you can just write a message of hope or support. Then stick your Pink Dragon Lady to the wall of the corridor or the seating area. The more, the better. Let’s turn the dojang pink! We’ll take collections through Saturday, November 4th. We’ll send the money to the NBCF the following week. by James, 2nd degree black belts in TKD and HKD, HKD instructor, who is doing this to support friends and family who have been diagnosed with breast cancer. How Often Should You Go to Martial Arts Classes? Students line up for a belt test in June 2017. 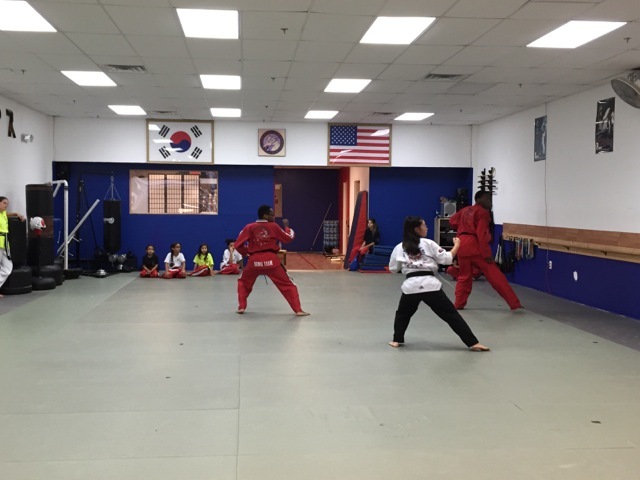 Many people ask this basic, yet complicated question: How often should I go to TaeKwonDo or HapKiDo class? When I signed up, Master Yun said, “Come twice a week. Three times a week is even better.” So when I was a white and orange belt, I went twice a week. I would go on Tuesdays and on Fridays. After a few more belts, I decided that in order to be able to remember all the previous forms, kicks, and miscellaneous other movements, I needed to start going 3 times a week. So I added Wednesday Tae Kwon Do to my calendar. Then, once I became red belt, it becomes mandatory to remember earlier belt forms for your stripe testing. So I started going on Saturday. A year goes by, and I become a bo black. Bo black training starts, and I remember that you have to spar during the black belt test. So I started taking class on Thursdays as well. By the time I took my black belt test, I was taking TKD classes four or five times a week, including sparring on Thursdays. A senior black belt told my mom that going four times a week is optimal because “you’re going to the studio more often than you’re not” in any given week. I guess this means my body doesn’t have a chance to forget my kicks, forms and breaking. Really good advice. Why not go five or six times a week? I think rest is equally important. Another senior black belt told me that it’s important to let your body heal in between really hard training sessions. I have boy scouts and Kumon on Mondays, so I don’t go Mondays. I like to relax on Fridays and the studio is closed on Sundays. So it all works out. What schedule is right for you? Only you can decide, but going more often than you’re going now is probably the right thing to do. 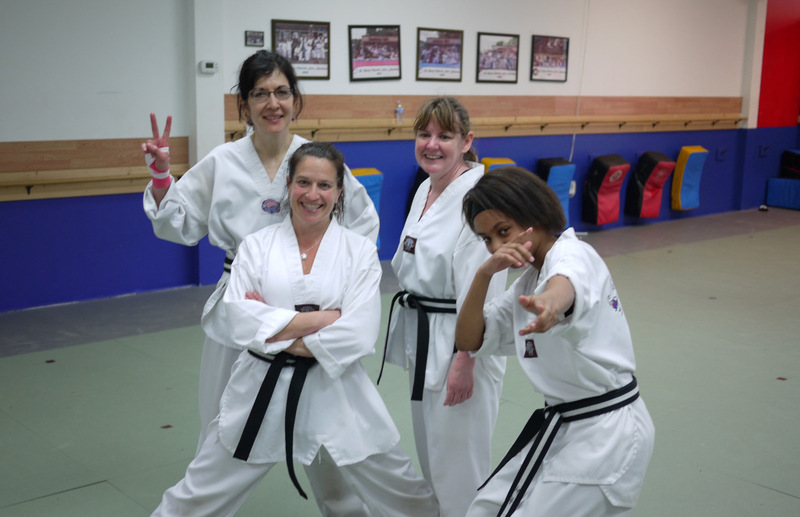 Joanna, Andrea, Laura (the author of this blog post) and Sara took their TKD black belt test in June 2015. This photos was taken a few minutes after the 3 1/2 hour test ended. Perhaps you have been watching your child take Tae Kwon Do for a while. You show up, grab a seat on the bench and start scrolling through your phone, chatting with the other parents or catching up on some reading for the 45 minute class. Occasionally, you look up to see what’s going on, but you’re just killing time until class is over. Some days you probably look over and think what they are doing looks like a lot of fun, but that it’s just for kids. Or that you are not athletic. Or that you are too old to learn or you would never be able to kick like they do. I’m here to tell you to give it a try. Why? Because it’s a great workout. It’s a full body workout; cardio, strength, and core all rolled into one class. 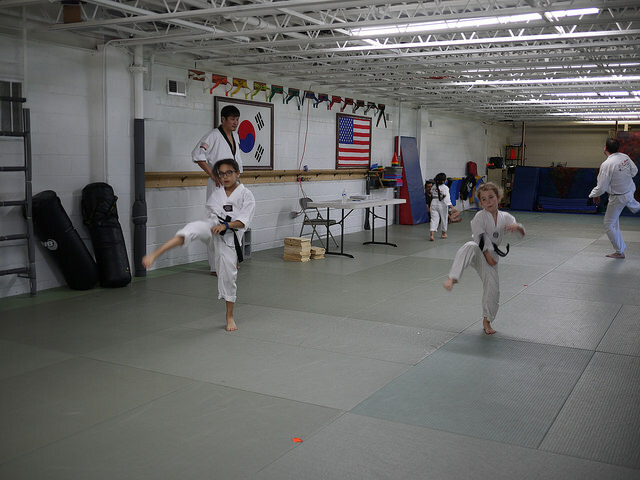 Tae Kwon Do is designed to be a self-paced program. You can come as often as you like and progress as fast or as slow as you are comfortable doing. Few people begin a Martial Arts program in great shape. The use of the belt system is designed to allow for this. Your white belt is a clear indicator to the instructor and to your fellow classmates that you are a beginner at this, so less is expected of you. The only thing that is asked of you is to try your best. Why? Because it’s also great way to reduce stress. For most kids memorizing the forms (a complex set of movements combining blocks, kicks and strikes) comes easily. Kids are sponges; it’s not as easy for adults. It forces you to utilize a part of your brain that you have not accessed in years. It requires concentration, balance and coordination. It truly requires you to be dialed in and focused into the moment. Suddenly you are checked in, not checked out and you will find that the stresses of the day evaporate. Why? Because it a great way to increase self-confidence. Tae Kwon Do builds both physical and mental confidence. Mastering a new kick, squeezing out one more pushup when your arms are wobbling, or smashing through your breaking technique is an amazing feeling of accomplishment. There is a direct link between increased physical confidence and improved mental confidence. So give it a try, sign up for a two week trial. You have nothing to lose and everything to gain. 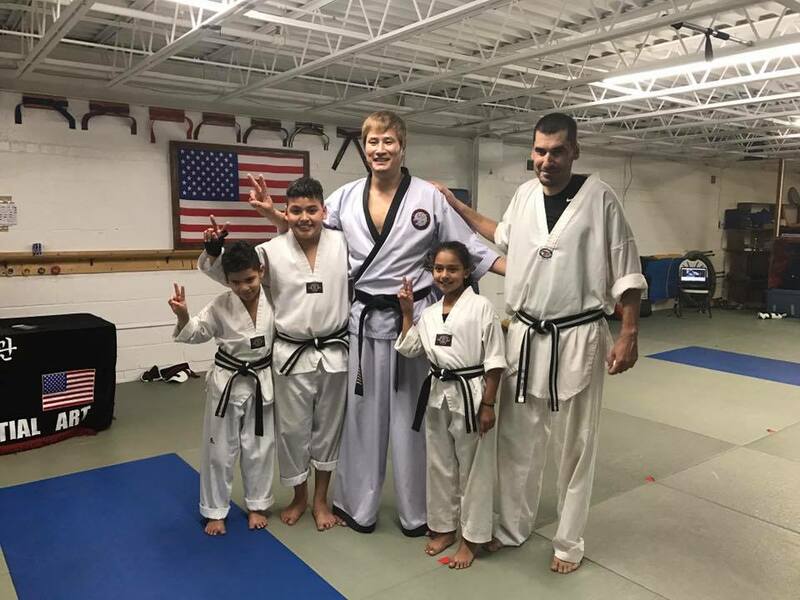 From earlier posts, you have probably noticed that Be Ryong Martial Arts curriculum and testing requires a tremendous amount of strength, stamina, and mental toughness. It is particularly so during the Black Belt Testing cycles. Generally, you will train for a minimum of 6 months from the time you put on your Bo-Black belts until you test for your Black Belt. It’s really important to use this time wisely to create the mental toughness, strength, and stamina that are required to succeed. Some other great cross-training is weight training. I know, I know, you don’t have a gym, or some other such reason, but… You do have your own body weight and a floor, so, you really have all you need to get started. Push-ups, yes, remember you will do at least 770 during your Black Belt test, are body weight exercises and you can do them almost anywhere. On the floor in your office, in the hallway at home, on the patio, on the deck by the pool, or even on the floor in front of your TV! Just do them a few at a time, 10 then 20 then more. Practice doing them slow, fast, different hand spacing, on your fists, on your wrists, just do them and do them in proper form. Pull ups are fantastic. Live near a school or playground? Find the monkey bars and start it out. Can’t do a lot? Do a few at a time and work your way up. Almost anything can be used as a weight, a gallon of milk, a can of corn, get creative and have fun with it. Cycling is a great cardiovascular cross-training exercise too. Just ask Daniel, he rides hundreds of miles each week and takes Hap Ki Do and Tae Kwon Do as well. Many of your classmates commute to and from work by bicycle. It’s great and we have plenty of safe trails to ride on around here. In the summer, you can swim in an outdoor pool and an indoor pool in the winter. It is low impact and very highly effective at strengthening your muscles, most of which you don’t use as much as you think you do. Don’t believe me? Go to the pool and swim 20 laps, then come see me the next day. It’s also critically important to stretch. You might think that’s not exercise, or cross-training, but you would be mistaken. Take a yoga class, or Barre, or Pilates. Do the Wii Fit Balance Board yoga work out. Sit in front of the TV and stretch after you have done push-ups and sit-ups during commercial breaks ☺ You know stretching improves flexibility and flexibility improves your kicks right? How can it hurt to work on these two things as a means of cross-training? Answer, it can’t hurt. No matter what you do, if it is different than what you are doing in classes, it is cross training and it is helpful to you as a martial artist. It can also be fun. So enjoy your cross-training and we will see you at Be Ryong Martial Arts! 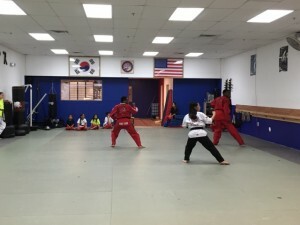 What Happens During a TaeKwonDo Black Belt Test? 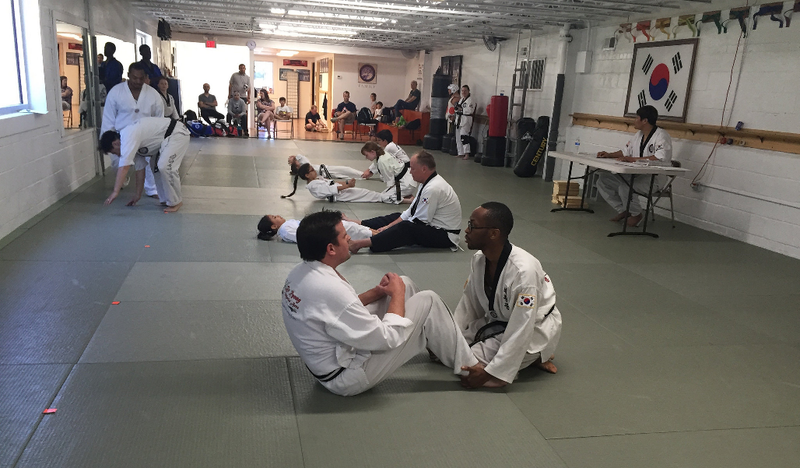 Every studio is different, but at BeRyong, a first degree black belt test has 10 stages. This test generally lasts about three hours and is non-stop. At Be Ryong, Master Yun won’t even let you take the black belt test until he sees that you have mastered all the lower belt kicks and forms. Ultimately, the test is one of endurance. At the end of the test, you’ll understand why Master Yun says that a black belt test is a physical and mental test. Here are the 10 stages. Warm-up (a bunch of jumping jacks) and stretching. Kicking. You do each belt’s kicking combination up and down the studio. Push-ups. You do a lot of push-ups during a black belt. You start with 20 push-ups at white belt and you add 10 push-ups as you go up the belts. By the time you’re on brown belt, you’re doing 120 push-ups. Yes, you end up doing 770 push-ups during the course of the test. Forms. You run through all the belt forms. If Master Yun doesn’t like one person’s form, you may all be asked to repeat a form. Sit ups. Same as the push-ups, you do sit ups with each belt, starting with 20, until you do 120 at brown belt. Yep, you end up doing 770 sit ups during the test. Squats. After blue stripe belt, the squats start, starting with 10, adding 10 more with each successive belt. After you’ve gone through all the forms, you do three rounds of sparring. The first 2 are against 1 black belt; each round lasts 1.5 – 2 minutes. During the third round, you go up against 2 black belts, alsso for 1.5 – 2 minutes. Yes, you will take a beating. Why sparring at the end of the test? Because any martial arts-trained person can fight fresh; the black belt test shows you can fight even when you’re exhausted. Breaking. Prior to the test, Master Yun will work with each student to develop three kicking combinations of three kicks each. So you’ll end up breaking 9 boards (10 if you do a double kick). As the Grand Finale, you do hand breaking. If you are under 8 years old, you break 5 thin boards, over 8 you break 5 thick boards, and over 18 you break a 2 inch thick slab of concrete. If you’re over 18 and you don’t succeed in breaking a slab of concrete, you’ll be presented with 5 thick boards. At the end of the test, after all the kicking, forms, sparring and breaking, you get to eat Korean Food! So you’ve achieved a Bo-Dan/Bo-Black belt, the final step in front of a Black Belt—now what? You may think that a black belt test is just like any other belt test. Well hold on a minute. Don’t even think about sitting down because you haven’t even STARTED the training for a Black Belt! Admittedly, Master Yun at Be Ryong is a bit old school when it comes to earning a Black Belt. Master Yun recommends training a minimum of six months for a black belt test. In addition, you must prove to Master Yun that you are ready for the responsibility of being a Black Belt. We recommend attending to at least four classes a week along with the Black Belt training class on Fridays and Saturdays. If you can, take two or three classes in a row to build up your stamina and endurance. During bo dan training, you won’t be learning any new forms or kicks. Instead, you spend time working on kicks, forms, breaking, push-ups, sit-ups, and squats. Focus on developing muscle memory so that when Master Yun or an instructor asks you to do the red belt form or kick, you can execute the form or kick without any hesitation. Focus also on improving your forms and kicks during every class. Ask your instructors and other black belts to critique your forms and kicks and give you suggestions for small changes to make your techniques better. Aim to get better with every single class and prove to Master Yun that are you doing your best and training hard. Next time, we’ll blog about training for the sparring and power breaking portion of the black belt test. There are many reasons why Tae Kwon Do is good for children. First, TKD teaches kids about pursuing their goals. Most young children will not have come across many major challenges. But with TKD, they will be sufficiently challenged while also being able to look forward towards the next belt. The second reason is that TKD teaches persistence. If they aren’t able to get their red stripe on the first try, they must learn to stay motivated and try again after more practice. The third reason is discipline. They will learn that if they don’t listen to the higher belts and instructors, then they won’t advance on to the next belt. The fourth reason is self defense. They will learn a large assortment of blocks that will teach them to counter any attack. Finally, and this reason is for parents. Parents, instead of just sitting, waiting or watching your kids practice, you can join your child in the fun that is TKD.